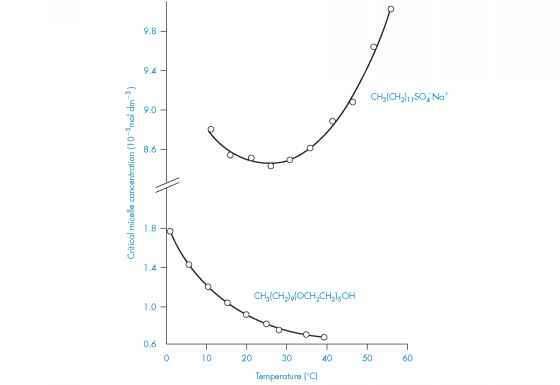 Figure 6.29 Variation of cmc with temperature for: sodium dodecyl sulfate (CH3(CH2)ii SO- Na+) and pentaoxyethylene glycol monodecyl ether (CH3(CH2)9(OCH2CH2)5OH). Modified from E. D. Goddard and G. C. Benson, Can. J. Chem., 35, 986 (1957) with permission. 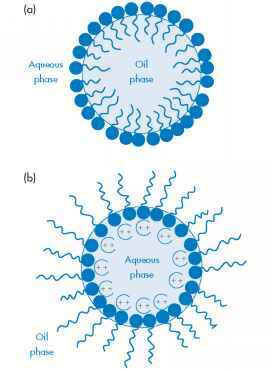 micellar size and a corresponding decrease in cmc is noted for many nonionic surfactants (Fig. 6.29). The cloud point is very sensitive to additives in the system, which can increase or decrease the clouding temperature. Temperature has a comparatively small effect on the micellar properties of ionic surfactants. The temperature dependence of the cmc of sodium lauryl (dodecyl) sulfate shown in Fig. 6.29 is typical of the effect observed. Figure 6.30 Diagrammatic representation of forms of lyotropic liquid crystals.